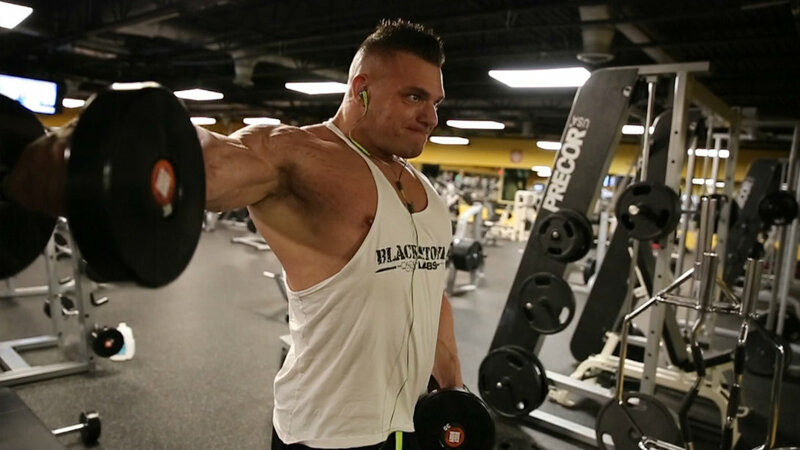 Push yourself to the limit and test your boundaries with this week's badass workout from Blackstone Labs/Prime Nutrition President PJ Braun. For the true M&Fer, the drive to enhance training performance and physique development is the ultimate goal, which is why we're always looking to present the most cutting edge training techniques and routines like our badass workout of the week. In this weekly video series, PJ Braun, president of Blackstone Labs and Prime Nutrition, presents a workout that's guaranteed to deliver body-chiseling results that's truly badass on every level. This week's badass workout is a vicious, high-volume delt-blaster that will hammer your shoulders with a barrage of badass moves. Do it right, and you're done in 30 minutes. If it's boulder shoulders you crave, put your pain threshold to the test with this week's badass workout. To be completed in 30-minutes, including warm-up (see all the moves in the video above). Warm up with 3 sets of Cable Side-Lateral Raises. 20 reps per arm. You must fail between 12-15 reps per exercise with zero rest between exercises. All 6 exercises are done in that specific order before resting. Rest period after each cycle is 2 minutes. Perform the cycle for 6 total revolutions. Finish with Dumbbell Circles: 3 sets of 15 reps, in between each set perform a deep static stretch! Check out last week's Badass Pec-Punishing Workout! This content is supplied and sponsored by Blackstone Labs and Prime Nutrition. For more on Blackstone Labs, visit http://blackstonelabs.com/. For more on Prime Nutrition, visit http://prime-nutrition.myshopify.com/.